1. Slice corn kernels from cob and transfer corn to a large bowl. Mix in red onion, radishes, baby lettuce and basil. 2. Add white wine vinegar, olive oil, salt, and pepper. Toss well and serve. You are probably familiar with the crisp and spicy taste of raw radishes, but have you ever tried a roasted radish? They offer a surprising nuttiness and depth of flavor. 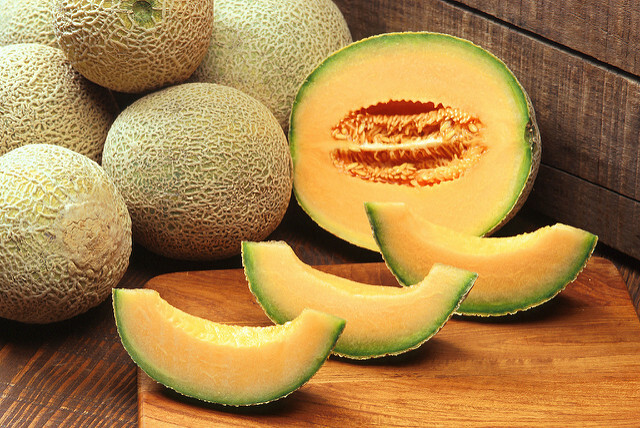 These delicious gems are a wholesome snack by themselves or would be great alongside fish or another main dish. 1. Preheat oven to 450 ° F.
2. Scrub and rinse the radishes. 3. Then, cut off radish tops, and cut the radishes in half, lengthwise. 4. Place radishes in a medium-sized bowl, and drizzle with the olive oil. Toss the radishes until coated with olive oil. 5. 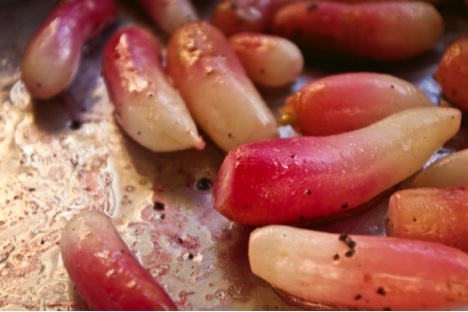 Place radishes on a prepared baking sheet, cut side down, and sprinkle with sea salt. Roast radishes until they are crisp tender, about 18 minutes, stirring occasionally as they roast. 6. In the meantime, melt the butter in a small skillet over medium-high heat. Add a pinch of sea salt to the skillet, and cook the butter until it browns, about 3 minutes. Be sure to stir the butter often, so it does not burn. 7. Once butter is browned, stir in the lemon juice. 8. Roughly chop the parsley and set aside. 9. Move the roasted radishes to a serving bowl, drizzle with the brown butter, and sprinkle with the parsley. Serve. Recipe adapted from Bon Appétit. 1) In a bowl, whisk together balsamic vinegar, Dijon mustard, vanilla extract, sea salt, and black pepper until well combined. While continuing to whisk, slowly stream in olive oil. Set aside. 2) Combine melon, cucumber, radish, arugula, feta, and basil in a large bowl. Toss with vinaigrette and serve.